For this reviewer one day internationals have never lingered long in the memory. As a youngster I was around when the format started, but of the myriad of matches played over the last half century the only games I can vividly recall are those from the very first World Cup back in 1975. Given the way that I can recall with ease so many of the Test matches I have watched over the period, and that I do enjoy watching the one day game and certainly have no fundamental problem with it I find this strange. Forgetfulness does however make a book like Ruling The World all the more interesting. 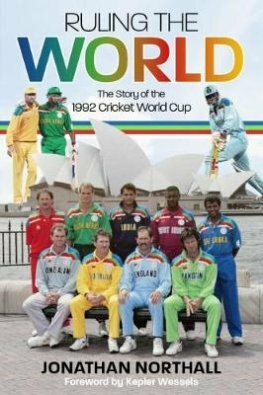 When I first opened Jonathan Northall’s book all I could readily recall of the 1992 World Cup in Australia and New Zealand was, Ian Botham’s scriptwriter having chosen to give the match a miss, England’s disappointing performance in the final. I was soon reminded of other events however, particularly the grossly unfair way in which we got there in the first place, following that shower that changed South Africa’s semi-final target from 22 runs in thirteen deliveries, to 22 runs from a single delivery. On that subject what I didn’t know until I read Ruling The World was that had Messrs Duckworth and Lewis’ formula been in force the target for burly all-rounder Brian McMillan from that last ball would have been a mere four. I had also forgotten that, originally, a South African team only just readmitted to the ICC fold had been denied the chance to compete, and the rather cloak and dagger way in which that decision was reversed. The book begins with that story, and is followed by a brief summary of what had happened in the first four tournaments. The main purpose of Ruling The World is then to give a detailed account of each of the competition’s 39 matches with, inevitably, more attention being spent on the latter stages. Before that there is a chapter introducing the teams. The match descriptions presented Northall with a considerable challenge. There were plenty of contemporary accounts written and much footage is available online for anyone wanting to view the action. This brings advantages and disadvantages in that he could have prepared a readable and authoritative account without leaving the comfort of his own living room. That sort of approach would not, however, have been one that provided anything insightful. That trap is clearly one that Northall saw coming and his acknowledgments refer to the names of as many as 73 individuals who assisted him with his research. Of those fourteen were players including Derek Pringle, Phil De Freitas and Vinod Kambli, although sadly none were from the victorious Pakistan side. The results are interesting and well written reports that hold the readers’ attention, no mean feat given that by their very nature some of the matches were of no particular significance nor as things turned out, in any way remarkable. Was the 1992 World Cup the best of them all? I’m afraid that neither Jonathan Northall or anyone else will ever convince me it was even a patch on that first tournament back in 1975, although it did spawn something quite amazing. Understandably the whole of Pakistan celebrated their victory over England, and the celebrations were as joyous in the Kacha Gari refugee camp in the north west of the country as anywhere else. The residents of Kacha Gari originated in a country with absolutely no cricketing background or pedigree whatsoever. But a handful of young Afghans had fallen in love with our great game and, 28 years later, Afghanistan will take their place in the 2019 tournament. They won’t win it of course, but the Afghans do have the world’s second, ninth and fifteenth ranked bowlers in the format – it is surely the most remarkable achievement in the history of any sport. But the realisation of the Afghan dream is another story (the first part of which is told in Nitar Suthar’s splendid Corridor of Uncertainty) and beyond Northall’s brief. What he has certainly accomplished however is to remind me that the cricket World Cup is a big tournament, and he has whetted my appetite for the 2019 version, now just a few weeks away. I do not know if he intends to treat any other World Cups to a similar publication, but if not then for another writer to do something similar would be no bad thing, and they could certainly follow the way this well illustrated book is set out. There is a detailed scorecard for each match and all the statistics a reader could want together with an excellent index. The book and the tournament it covers also serves as a timely reminder of just how great a batsman the late Martin Crowe was. Ruling The World is certainly recommended.